Steeplechase is an active adult community that is part of the larger, master-planned community of Churchill Club. Tucked away in a quiet corner in suburban Oswego, Steeplechase at Churchill Club is comprised of 212 age-restricted duplexes and ranch single-family homes. This intimate community has its own exclusive clubhouse as well as an activities director who organizes events and activities solely devoted to the mature residents of Steeplechase. In addition, the amenities of Churchill Club are available to all homeowners. These include athletic fields, basketball and tennis courts, as well as dedicated open space and natural wetland areas. The 6,000 square-foot clubhouse of Steeplechase at Churchill Club is open exclusively to its active adult residents. Here, residents can gather to meet neighbors and make friends. Social areas include a welcoming great room with stone fireplace, a multi-purpose area, a separate card room, and a kitchen that is equipped with full appliances where home owners can host parties or reunions. Residents can stay fit by utilizing the fully-equipped exercise room that features the latest in exercise equipment for low-impact workouts. The clubhouse also includes an outdoor pool and a landscaped deck area. A full-time lifestyle coordinator affords an energetic lineup of physical and social activities at Steeplechase. Steeplechase is comprised of 86 duplex homes and 126 single-family homes that were constructed between 2005 and 2008 by Town & Country Homes, a builder which has now been acquired by K. Hovnanian. Both styles feature low-maintenance designs with single-level convenience. The duplex homes come in three different floor plans and have between 1,313 and 1,536 square feet of living space. Each duplex floor plan offers two bedrooms, two full baths, a two-car attached garage, and a great room. The single-family ranch homes are available in five floor plans sized from 1,766 to 2,183 square feet, with two bedrooms and two full baths. Single-family floor plans also contain two-car garages, dens (per plan), over-sized great rooms, and optional basements. Many of the homes are equipped with modern floor plans and sought after features. Resale inventory may also include designer selections of options, depending on previous owners and price range. Steeplechase offers quiet charm and easy living in one of the most popular addresses in Chicago's southwestern suburbs. Sleek homes, built for endurance, combined with terrific on-site amenities make Steeplechase a desirable community for active adults in the Midwest. Scheduled events, organized by the clubhouse manager, include theme nights, holiday parties, and day trips to local attractions or sporting events. Residents are also active in a variety of clubs. These include writer's club, bridge, canasta, book club, poker, dinner club, and scrapbooking. Oswego is a quaint town that originated as an Indian settlement nestled along the Fox River. 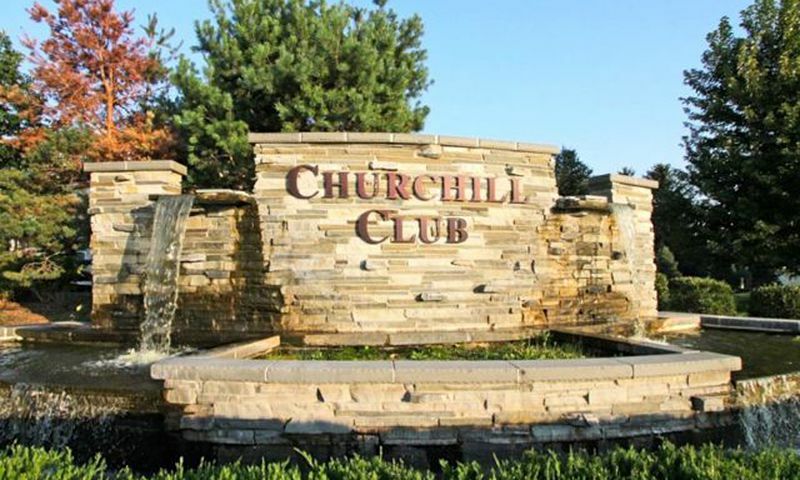 Steeplechase at Churchill Club is located just off the Route 34 corridor and is only minutes away from shopping, dining, and daily services. Oswego is home to several golf courses and also has a variety of cultural attractions and family-friendly destinations. These include the Little White School Museum, Hudson Crossing Park, and Oswegoland Civic Center Aquatic Park. For commuting, as well as running daily errands, it is easy to connect to Interstates 88 and 55 as well as Routes 30, 34, 74, and 59. In addition, the nearest Metra station is close by on Route 59 which makes traveling to Chicago a breeze. Other notable cities in the area include Naperville, Plainfield, and Batavia. The following amenities are available to all residents in the Churchill Club community. They are ideal retreats for grandkids when they visit. Clubhouse - 8,400 Sq. Ft. There are plenty of activities available in Steeplechase at Churchill Club. Here is a sample of some of the clubs, activities and classes offered here. The attached duplexes are ideal for homebuyers who want the Steeplechase lifestyle at a reasonable price. All duplexes are built on a slab and offer open layouts. The single-family homes include spacious layouts with optional basements. All plans include an over-sized two-car garage with additional storage space. 55places.com is not affiliated with the developer(s) or homeowners association of Steeplechase at Churchill Club. The information you submit is distributed to a 55places.com Partner Agent, who is a licensed real estate agent. The information regarding Steeplechase at Churchill Club has not been verified or approved by the developer or homeowners association. Please verify all information prior to purchasing. 55places.com is not responsible for any errors regarding the information displayed on this website.